The Topsify Paramore Oakland Give Away Sweepstakes is offered only in the United States to legal residents of the fifty (50) United States and the District of Columbia, excluding Puerto Rico, who at the time of entry are at least eighteen (18) years old. 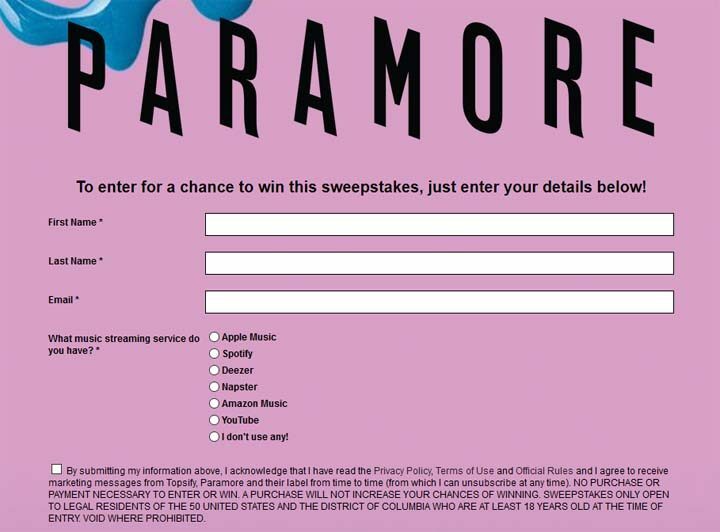 The Topsify Paramore Oakland Give Away Sweepstakes ends at 11:59 PM E.S.T. on July 8. To enter, visit the registration page available at tools.topsify.com/follow/2574/win-a-trip-to-see-paramore and either (a) follow the “Alternative Nation” playlist on Spotify; or (b) use the alternative entry method by clicking on the “you can enter here instead” link. Entries are limited to one per Spotify account or individual. One (1) grand prize winner will receive a trip for two (2) to Oakland, California, consisting of: (i) if the winner’s residence is more than two hundred (200) miles outside of the city of Oakland, California, then the prize will include round-trip economy airfare for the winner and his/her guest, leaving together from the same gateway from a U.S. airport within fifty (50) miles of winner’s home to an airport within fifty (50) miles of Oakland, California; (ii) if the winner’s residence is less than two hundred (200) miles outside of the city of Oakland, California, the Flight will not form part of the prize and Sponsor, in its sole discretion, will arrange for ground transportation for the winner and the guest between the winner’s residence and Oakland, California; (iii) two (2) nights of hotel accommodation in Oakland, California at a hotel to be selected by the Sponsor in its sole discretion for the winner and his/her guest based on double occupancy; and (iv) two (2) tickets to the Paramore concert on September 24, at The Paramount Theater in Oakland, California. The prize has an approximate maximum value of Three Thousand Dollars ($3,000).